Gossip is one of the most destructive of all human sins. What does God think about it? 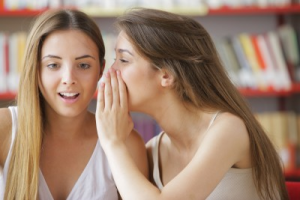 What biblical principles can we apply to stop gossip in its tracks? Let’s first take a look at a secular definition from the dictionary about what gossip is. The definition of gossip includes: Rumor or talk of an intimate nature that is personal and sensational. Something spoken by a person who habitually spreads intimate or private rumors or facts . The words that stand out to me are “personal”, “sensational”, “rumors” and “spreads.” These are spoken by others about someone that can involve rumors or facts, but either way they are private…or at least should be. A conversation that involves talking about another person when they are not present can include malicious, damaging, rumors or facts. These tidbits can either be true or false. Either way, they are damaging to the person who is not present to hear them. Like a wildfire, gossip can spread rapidly and cover a great many people in a short amount of time. I live in a very small town and it is a frequent occurrence to hear gossip about others. Sadly, there is no way to confirm whether these rumors are true or not. Even if it is true, it’s an invasion of privacy and generally tends to assassinate a person’s character. It degrades the person being spoken about. Gossip devalues them, embarrasses them, and can humiliate them if the gossip gets back to them. I used to work at a small factory and the joke around the shop was, “telegraph, telephone, and tell a machinist.” How true that was. When I heard rumors about co-workers, it rarely made sense to me because I knew almost everyone there after seven years of employment. The vast majority of time it was untrue and I considered it a false accusation. Besides, it was none of my business. Proverbs 17:4 An evildoer listens to wicked lips, and a liar gives ear to a mischievous tongue. Exodus 23:1 You shall not spread a false report. You shall not join hands with a wicked man to be a malicious witness. Romans 1:29 They were filled with all manner of unrighteousness, evil, covetousness, malice. They are full of envy, murder, strife, deceit, maliciousness. They are gossips. Proverbs 10:18 The one who conceals hatred has lying lips, and whoever utters slander is a fool. Those who listen to gossip are just as guilty as those who are spreading it, for if there is no audience, there will be no one to tell or as the Bible says, “For lack of wood the fire goes out, and where there is no whisperer, quarreling ceases” (Proerbsv 26:20). If everyone who began to hear gossip walked away, then the fire would go out. If there is no one to listen, then there will be no one to tell the tale. God commands us to not even be “around as a slanderer” (Leviticus 19:16) nor join in with them (Exodus 23:1). If you are at a job or situation where you can’t walk away, you can refuse to listen or try to change the subject. If you are stuck as a captive audience, read the last tip in the section to find out how you can stop it immediately. If you refuse to listen to gossip, you’ll be less tempted to pass it on. Even if it’s too late and you’ve already heard it, keep it to yourself, because the Bible says, “but he who is trustworthy in spirit keeps a thing covered” (Proverbs 11:13). If you are a friend of this person or not, please remember that “a whisperer separates close friends” (Proverbs 16:28) and “sows discord” (Prov 6:19). I know this sounds a little harsh, but if you’ve refused to listen and had to walk away, and they still insist on telling you things that are none of their business, just choose to “not associate with a simple babbler” (Proverbs 20:19). You can’t choose your enemies, but you can choose your friends or at least those who you associate with. Again, this may be hard to do, but to God “a false witness who breathes out lies, and one who sows discord among brothers” must be told that gossiping is an abomination to Him (Proverbs 6:19). The word abomination simply means that God detests or hates gossip. Maybe they honestly don’t realize that this is wrong, but I seriously doubt that. This is one of the most powerful means of all to stop gossip in its tracks. I have put it last but it is perhaps the greatest tool to stop gossip and cut it off at the source. One person at work once came to me and offered some unsolicited gossip to me while I was working. I didn’t have the chance to walk away so I simply told the person this: “Hey, why don’t we go talk to Darin (not real name) about what you said. It sounds like he is in some serious trouble. Maybe we can help. If he is having an affair with the secretary, he could get in trouble…or worse, get fired.” If you offer to go and talk to the person being gossiped about right away with the gossiper or tell them what you heard from them, the chances are very good that the gossiper will stop sharing their gossip with you altogether. If you can’t go to them then right away, tell the gossiper that you can talk to the person they are gossiping about when you get home, tell them that you could call them on their cell phone, or maybe go over and speak to them about, in person, what you heard. The person that is the gossiper, I promise, will never want to go to that party about their gossip and tell them to their face what they said. This shows that inwardly they really know that what they are doing is wrong. above all, violates God’s laws. God hates gossip because of what it does to all the parties involved. Gossip is sin. We should not stick our nose into anyone else‘s business and not use our mouth to repeat or make itching hears to hear what is none of our business (1 Thessalonians 4:11). There is nothing more destructive that can bring down a home, divide a church, and make enemies of friends. Those who gossip are full of pride because it always wants to make them look better compared to others. No one who is truly humble will talk behind someone else’s back. We know that God resists the proud but gives grace to the humble, so God will resist you who can not tame the tongue (James 4:6). Gossiping is actually akin to breaking of the commandment to not bear false witness (Exodus 20:16). In fact, “If anyone thinks he is religious and does not bridle his tongue but deceives his heart, this person’s religion is worthless” (James 1:26). The Proverbs forewarn us that “Whoever keeps his mouth and his tongue keeps himself out of trouble” (Proverbs 21:23). Jesus said that “on the day of judgment people will give account for every careless word they speak” (Matthew 12:36). We would do well to heed these biblical warnings. I blessed God for this Bible study and I appreciat you for this outline . I would love you to be sending much more Bible study outline to me and other Christian literatures for discipleship. By God grace am the General Overseer of GOD’S GENERALS ARMY EVANGELICAL MINISTRY INTERNATIONAL(GOGAEMI) a.k.a. GOD’S BATTLE AXE JER. 51:20-23. I will like us to be partners as we spread the gospel all around. You send post to Jesus Missionary Commission, p.o. Box 4047. Ilorin, Kwara State. Nigeria. Using my name. Thanks. Yours in Christ Evang Yusuf Samuel. Thank you Mr. Samuel for your kind words. I don’t know how we can team up with you in ministry as partners other than sending you articles. Is that what you mean sir? I am a bi-vocational pastor and have to work to support myself. I know postage for mail is the only thing I worry about. In what way can we help you sir? These articles are free to use on the Internet on this website. Let me know just how we can partner in your ministry in Nigeria sir. Thank you Charles for your kind words. I appreciate your blessings for us sir. Jack, this was really good. You gave some excellent ideas to get out of gossip situations. I had not heard of taking the gossiper to the gossip victim. That is a great idea if nothing else will work. Well done Jack! This was sound truth as always. God bless you brother! Thank you so much brother. I detest gossip and that’s the reason that in our church, many of the prayer requests have became “unspoken needs” for sadly, these prayer requests all too often turn to gossip. May God bless you for your encouragement to me Derek. What a really great article as always! Thank you. I must say, as a woman, it is very difficult to walk away from gossip, but I must say, I never pass it on (not that I can remember). And it can be difficult to follow what you have suggested above, although, very excellent suggestions, biblically based, but I think I would be most comfortable with a gentle approach and advising the person that this is not pleasing to God, and that even if the gossip is true, we need to forgive others and not be prideful in our opinions of them. Many thanks once again, Jack. Nikita…what a great suggestion. I thought that I had covered that in the section titled “Rebuke the Gossiper” but maybe I did a poor job of relating it. The way you said it is much better. Thank you so much. Great idea. I do apologise – you did state that one should advise that gossiping is an abomination to Him (our Lord). Suppose I just experience the word ‘rebuke’ as a strong admonition and that blinded me to what you were actually saying. You did an amazing job on this! Thank you for helping me to grow up in the Lord and become a true beacon of light in this dark hour. Also, this article has helped me to understand the importance of reading my Bible on a daily basis. It’s difficult to continue in gossip if my face is in The Book (Bible) and not Facebook. I notice how quickly I’ve engaged in gossip only to find that this weaken my testimony for those watching. I realized that within the work place, I’m suppose to lead a difference lifestyle (leading others to Jesus Christ) but if I take part in the ‘slander’; this causes others to fall and I’m responsible for shining a brighter light so that others wont be hindered as I partake in the gossip. This article has convicted me to confess my sin, turn away from it and trun to the Lord. With tears in my eyes, my heart is Thankful. It is goodness that has lead me to repentance today. Thank you, thank you THANK YOU!! Precious Blessings to you and your family. I appreciate your very kind words Cassandra but I too plead guilty…it is just so hard to nip it at the source. Wow…your humility in repentance shows that you have such a passionate desire for obedience showing me your love for God in obeying Him is very, very strong. I admire that and may God richly bless you for that. Truly God’s word gives assurance and strength to go on. I pray the Lord bless you mightily and abundantly in providing all your needs daily. Thank you for this article. I’m asking God to change my heart as I sometimes bring up the past of others and want to change 100%. I was feeling terrible and them read the kind ladies reply and felt a little peace. I’m going to spend a week reading and studying about my heart and ask God to give me the victory. Praise the Lord for revealing to me my sins. I was told by an elder…..if you can’t get away from that person right away, offer to pray for the gossiped person right away. We know how others tend to run away when we begin to pray! God bless you for giving us valuable lessons on God’s word to use in this sin, sick world.